Today is Papa Bears birthday. I haven't been alone/anywhere to buy him so much as a card. The least I can do today is be a cheerful partner and not ask when we are leaving to return home. I've been on my best behavior and often remind myself that this is just another day that I don't have to cook or wonder what to cook from the moment I open my eyes. 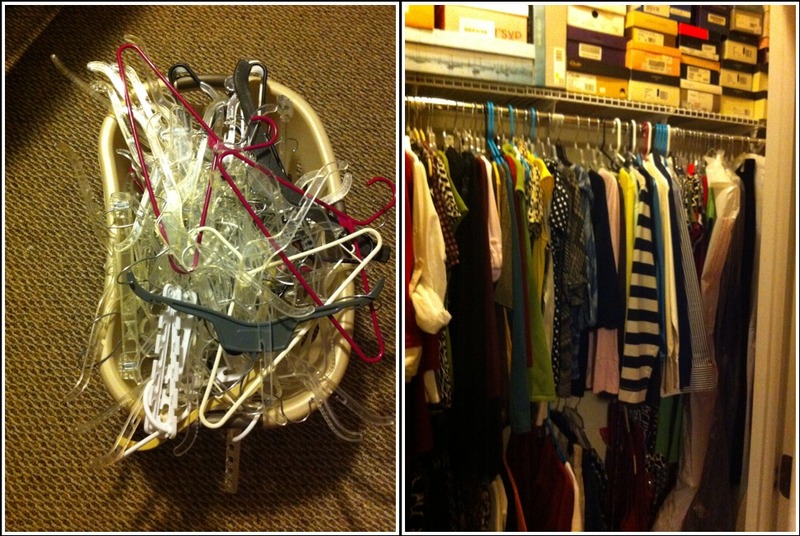 It was a week before my birthday when I had to make some critical you have no choice decisions - about my closet. Here’s how it went down. See what had happened was.... I just had too much STUFF and my closet fell down. I didn’t hear when it happened. 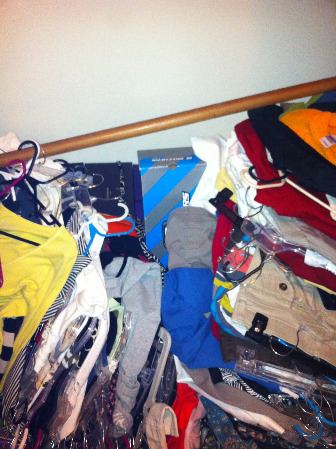 I just opened my closet one morning to discover this heap of a collapse. I wanted to cry but I didn’t have time. I had to keep moving. That was the day I was going to be making the cookies to be shipped overseas. So I just needed to get busy baking - after I emptied my closet. By sunset, thanks to Papa Bear, my closet had new shelves and hanging things. But I had another heap of a mess to deal with. I'm too old for this. But it's cute. I'm keeping it just in case. What size is it? Six. Oh never mind. No way am I wearing all those polka dots again. Why do I have so many belts? If I ever need another belt I'll just buy one. Big difference between a Sears small and an Ann Taylor small. I kept the Sears small. Aww man those were some nice jeans. I ain't never gettin in those again. They were tight when I bought them. Shame on you if you buy another turtle neck. I hate turtlenecks. When it was all done, I had one leaf bag full of trash and three bags for giving away. I got rid of this much hanging stuff and I LOVE my new closet insides. What a load off! Though this wasn't planned - it really feels good to be out with the old - now on to the new YEAR. Here's the thing... I also look forward to unpacking when I get home, it will be so much easier to put stuff away!